Today, Lois measures just about 64.25 inches. Her vertical growth has slowed to only .75 inches since yesterday – this, plus the bright purple streak that appeared on the her right side and the fact that the bracts have fallen off completely (see image below), indicate that blooming is imminent! And, we have some great news! 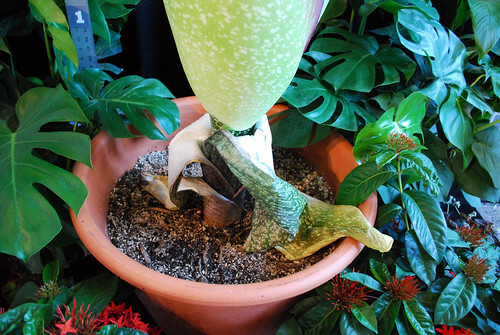 The Cockrell Butterfly Center will be open around the clock for the Corpse Flower Watch until after Lois has bloomed – come by any time to see her! You can get tickets here. I would love to see what type of phytoliths this plant produces– that bract would be a perfect part to check. So, is it blooming/stinking yet? I haven’t seen an update published since morning and the webcam is a lost cause for me. Thats a great idea! I’ll save the bracts and look in to that. Is it me or is the webcam feed down?